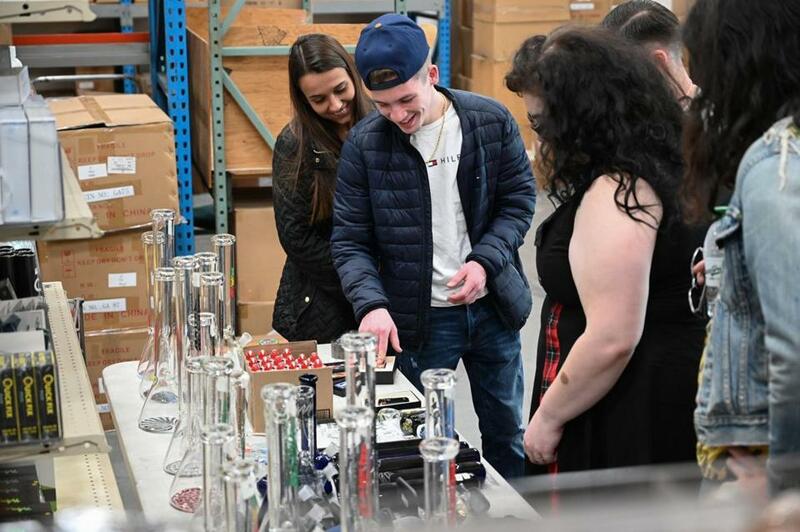 Tour members browse at a factory outlet selling bongs, rigs, pipes, and other marijuana paraphernalia in LA. Dubbed “The High End,” the shop will sell marijuana accessories including rolling papers, pipes, ash trays, bongs, and storage boxes. Since Barneys isn’t a licensed dispensary, it can’t legally sell weed. But there will be information about Beboe’s vape pens and edibles, which can be ordered online for delivery. The new shop is scheduled to open next month, according to a statement. The partnership between a cannabis brand and a luxury retailer comes as access to legal marijuana continues to spread across the United States. California is the world’s largest legal marijuana market, with Los Angeles the de facto capital of a weed culture that is pushing into the mainstream. Barneys is a fashion hub in many major cities, selling runway-worthy looks from high-end labels such as Balenciaga, Givenchy, and Saint Laurent. The racks at Barneys are a playground for shoppers who can afford $3,000 Prada dresses and $1,000 money clips. The push into cannabis comes as department and specialty stores have struggled to draw customers as shopping shifts online. Cannabis is one of the fastest-growing consumer products in the United States, with increased access to marijuana and CBD pulling billions of dollars from the black market into the legal economy.